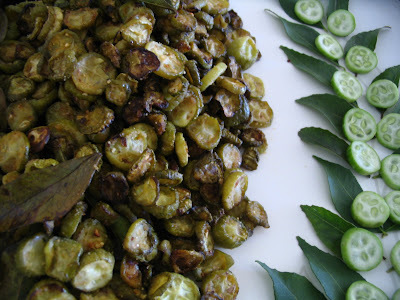 Dondakaya in telugu which is called kovakkai in tamil, Tindora in hindi, Ivy gourds in english is a small cute vegetable which has the crunchy texture. 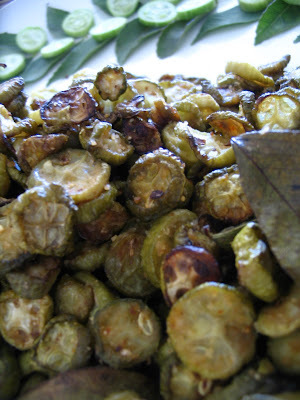 It is rich in protein and fibre which is yummy when cooked in different ways. So this is one of the easy fry which we can make and serve with rasam, dhal and hot steamed rice + ghee. 1. Heat oil in the frying pan and season with mustard and add the dondakaya. 2. Then add curry leaves close with some lid by sprinkling water and salt for few minutes until they are cooked. 3. Then remove the lid and saute until they become roasted. While it is roasting we can do the powder. 4. Fry the roasted gram dhal and chilli in dry pan. Cool it then add garlic and make powder. 5. Now add it to the dondakaya and mix well so that they all will get blended. 1. You can prepare the garlic powder ahead and in more quatities if you need it. 3. 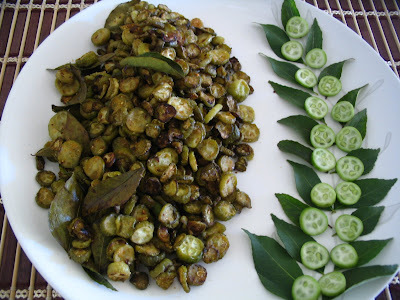 Dondakakya can be substituted by capsicum, Brinjal, and ladies finger. 4. And if you are not diet concious you can do deep fry instead of sauting and sprinkle this powder to coat it. Tastes so yummy. the decor wit the kadipatha nd the cucumbers really caught my eye..fabulously done!! Love this curry pavithra..But cutting this veggie takes so much time..looking yumm..
Amazing pictres! Feels like the tropics! The poriyal looks delicious! Love the roasted colour! Just found your blog...what a fabulously beautiful meal. I'll keep reading! super dish! Looks so tender and fresh! Nice recipe, pls now tell have u done any professional course in presentation ? no kidding...ur too good. Very interesting and delicious dish! I've never heard of the Dondakaya or ivy gourd before, thanks for the info! yummy koora! I make it the same way. It's a kid favorite curry too! Nice presentation as always Pavithra! Lovely presentation always..simple poriyal looks amazing! Looks really delicious I love the colour it makes me want to grab my fork and tuck straight in. This is my fav fry..perfect side dish with rice..
awesome Pavithra.....i will shift near ur place.....want to learn photography from you!! My Fav dish,this goes with rice ,chepathi very well...Ur way of presentation is wonderful.. Awesome decoration!! Simple and classic! !